"Easy does it." That&apos;s a mantra most current and would-be trawler owners would do well to keep in mind. We asked a dozen owners what they saw as the elements of an ideal trawler. These were people with different boats and different cruising lifestyles, so from that limited perspective readers might be surprised at the consistency of their responses. Nearly everyone seemed to be saying "easy does it." Ease of access, ease of maintenance and comfort were right up there with seaworthiness. Asked why they rejected the boats they did not buy, several came back with a variation on the same theme: too much work to refurbish. The lesson to anyone wishing to sell a trawler should be clear. Much of your market does not want to spend the time and effort catching up on your deferred maintenance. For the most part they are couples, retired or about to be, with an acute sense that the clock is ticking. 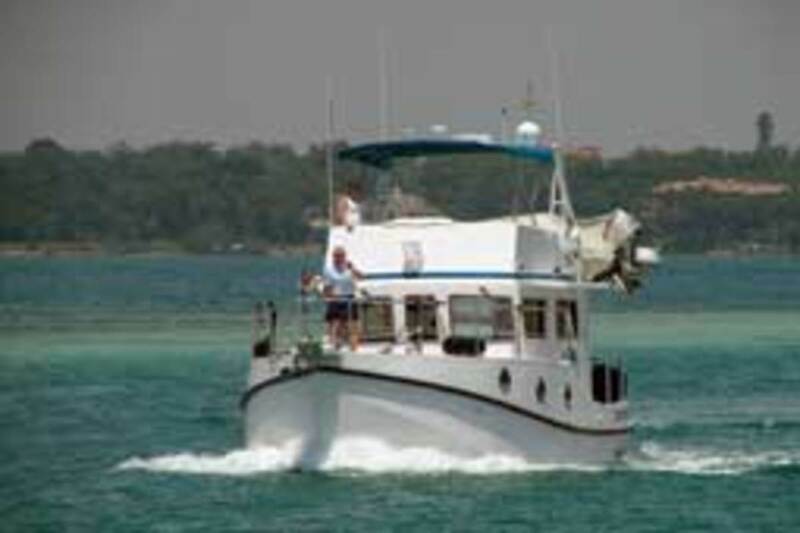 Conventional wisdom describes the trawler demographic as nearly identical to the cruising sailboat crowd, just a little older and a tad more affluent. We used to joke that the difference between cruisers under sail and those under power was "second marriage, first major medical procedure." 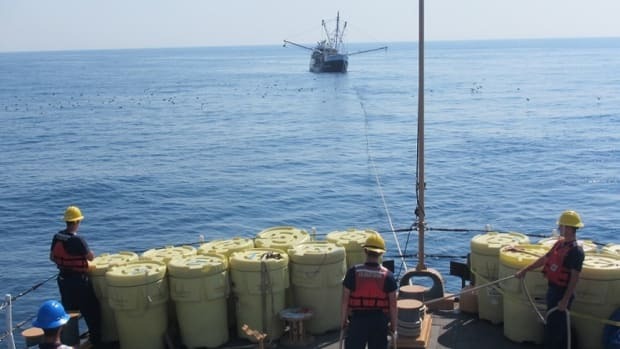 While researching this article, it happened that a Marine Trawler Owners Association group was enjoying a cruise up the St. Johns River near my home in Florida, so I inveigled an invitation to one of their dockside happy hours. Seven (of an estimated 1,000 association trawlers) were lined up at the Outback Crabshack docks on Six Mile Creek. The fall weather was splendid, and everyone was in a good mood. I arranged interviews with the owners later because cocktails and a serious exchange of information often do not mix well. One association owner who chose not to comment for the record seemed less happy than the rest. He had purchased a fixer-upper and complained more than once of having been overwhelmed by the work and expense of bringing his boat up to snuff. In hindsight, the bargain he thought he was getting had been no such thing. A third of the owners interviewed for this article - some from the association, some not - say they rejected boats because they were poorly maintained by the previous owner or were otherwise devalued. 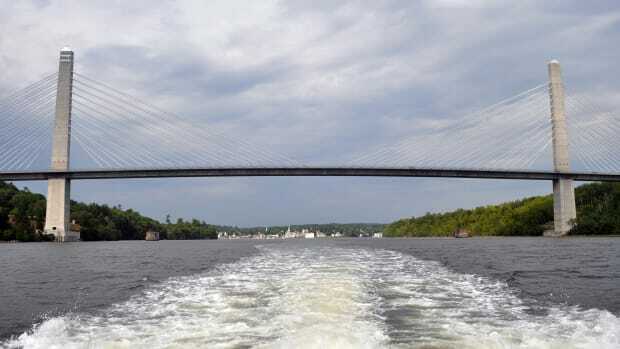 Joe Pica and his wife, Kathy, have cruised 16,000 miles on their Great Harbour N37 over the past three years. Many couples, having been sailors once, have come to the trawler market with a different dynamic. The wives were determined not to be fooled again. To be sure, wives play a part in any boat purchase, but when you listen to the voices at an owners association or Trawler Fest event you will better appreciate the high level of female engagement in what once was largely a male undertaking. It would be easy to assign the emphasis on comfort in our group&apos;s responses entirely to the influence of wives, had not several of their husbands also stressed the importance of easy access to engines and systems. What is that, if not wishing to be comfortable while changing filters? And Tom Hollinger, a retired associate professor from the University of Florida, used the word "livability" to describe the appeal of his Nordic Tug 42, which he and his wife cruise part time. "I like the idea of sailing, but as I get older I enjoy less standing out in the sun and rain day after day. The trawler is economical enough and reliable enough to let me not feel guilty about the small amount of fuel I burn," Hollinger says. "My wife likes to know she can have a nice shower without standing next to the toilet or having to leave a door open so that she can turn around. We both enjoy being able to have a cold drink and sit and read in comfort at the end of the day." The children of most cruisers are grown and gone, but in their place are four-legged executive vice presidents in charge of security, so boatbuilders ignore the canine element at their peril. Dogs love walkaround decks and are famously bad at ladders, particularly in the going-down direction. What about all that seamanship and seaworthiness stuff? 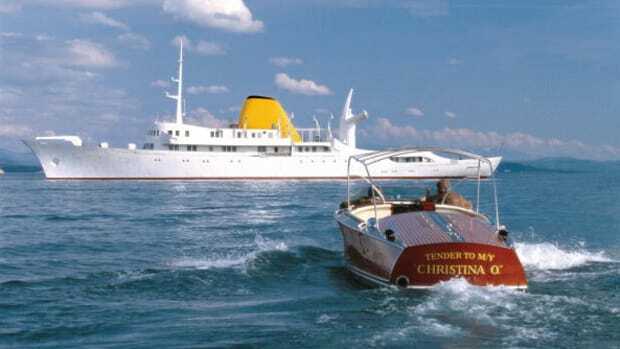 Most of the 12 owners genuflected to the notion of seaworthiness, but besides Baker, only Rudy Sechez and Joe Pica in our group put much emphasis on it. Sechez and Pica talked about the desirability of a hull designed for initial stability. Sechez built his 34-foot wooden "troller" himself, and Pica puts a lot of miles on his Great Harbour N37 as a full-time cruiser - more than 16,000 in three years. Again, much of what they said came back to the notion of comfort. 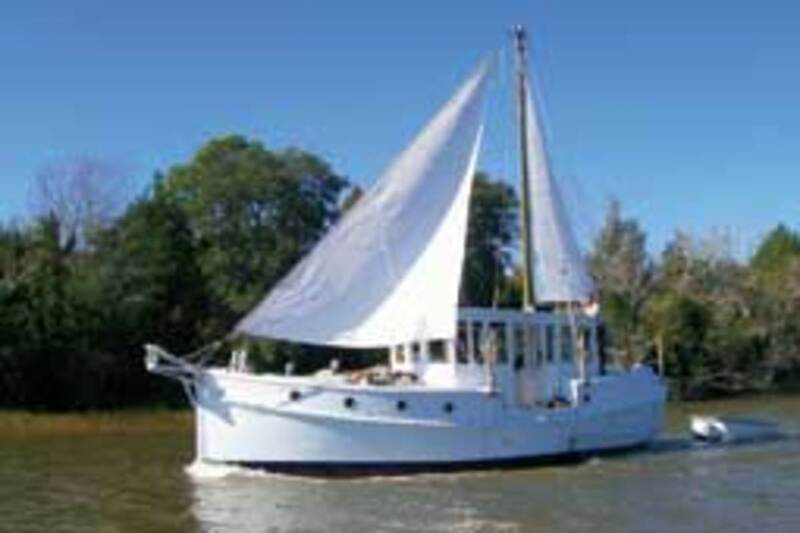 Rudy & Jill Sechez built their 34-foot wooden, "sail assisted troller."" "If the boat is to be used for offshore work, especially long-distance offshore work, it must be designed with that in mind. If it&apos;s to be used for coastal cruising, just about any design can work, though a comfortable motion may suffer," he says. "The importance of a boat inherently having a motion that is as comfortable as possible is that it can negate the need to install some form of a stabilizer system." Pica, who cruises with his wife, Kathy, and their dog, says he would not consider a trawler "prone to pendulous rolling without active stabilization, which is not effective when at anchor. We are very pleased with the stiff self-stabilization of our hard-chine N37 hull." Bob Kovach and his wife, Helen, both retired from electrical sales, are full-time East Coast cruisers aboard their 50-foot Marine Trader, Allez. With a saloon as homey as an English cottage, full of freestanding furniture, I pressed Kovach on his definition of seaworthy. "Seaworthy to us was a boat that would let us leave the dock and handle wind and sea conditions with small-craft warnings," he says. "We wanted a boat that would handle some wind and sea conditions to about 35 knots and seas of 5 to 7 feet. Our high bow, heavy displacement and Portuguese bridge fit the criteria." 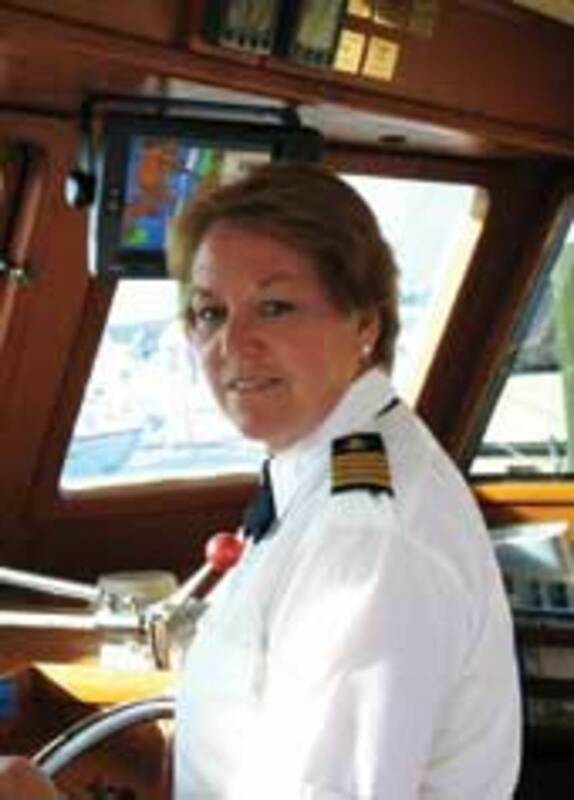 Helen Kovach is captain and her husband is the engineer aboard their 50-foot Marine Trader which they cruise full-time. The Kovaches have an unusual arrangement in that Helen, with her 100-ton master&apos;s certificate from the Coast Guard, is captain of the vessel, and her husband serves as engineer. "We have no bow thrusters or stabilizers, so we watch the weather, sea conditions and wind direction closely. 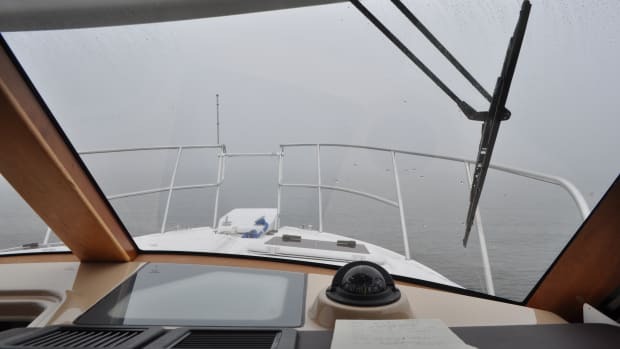 Helen has become very proficient using spring lines during docking maneuvers," Kovach says. Most of what we call trawlers are used exclusively in inland waters and for short coastal passages. You see many chugging up and down the Intracoastal Waterway. During the annual winter pilgrimage to George Town in the Bahamas, however, fewer than 15 percent of the hundreds of vessels anchored in the Stocking Island, roadsted are powerboats. Go farther down island and their numbers thin out even more. Clearly from their history and responses, that same three - Baker, Pica and Sechez - are the owners in our group most likely to venture the farthest. Baker&apos;s ambitions have taken him across the Atlantic. Each loved their comforts but also dwelled on the importance of offshore performance. For the rest, a leisurely schedule and superb modern weather forecasting will keep them safe in port - with all the comforts of home - until the squalls clear and seas subside. "Quality, dependability and comfort are important, and support from the builder, as well as from the broker where the boat is initially purchased. Wilde Yachts in Essex [Conn.] has been extraordinary from day one. ... We just loved the design and look of the Ranger Tug. It packed a lot into a very small space, yet we can still overnight on it. It has everything we need while we learn how to cruise. It&apos;s a very safe, sturdy boat. We could not find anything small that has a reliable diesel inboard, and that was a huge factor for me. ... 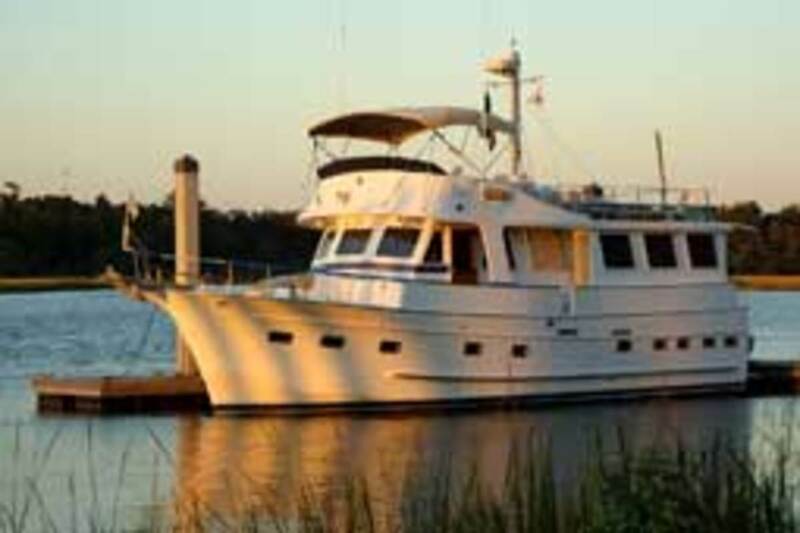 Ultimately, our goal is to purchase and live aboard a 39 foot Nordic Tug." 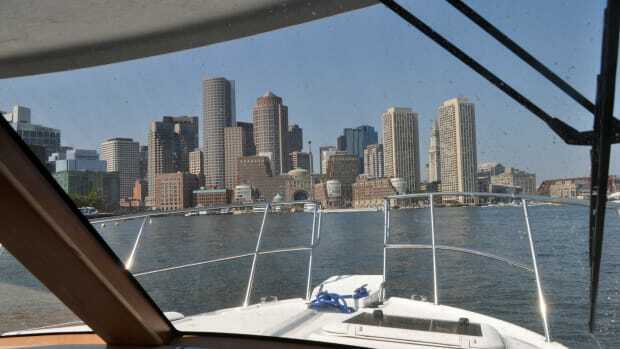 "It is fun to think about having a large boat, but large boats have less access to shallow waters, which might eliminate some interesting ports of call. When I think of steel boats, they seem to have some nice features, but then one has some more maintenance. 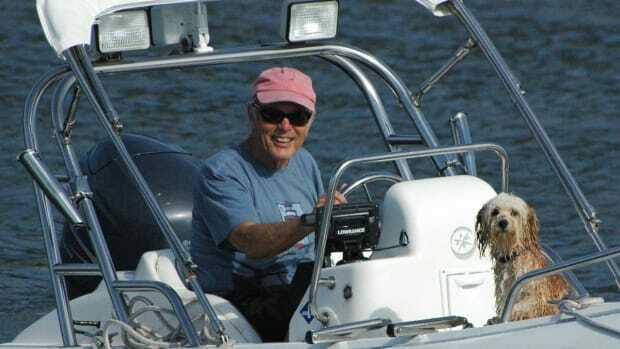 When I consider faster boats, I realize I don&apos;t enjoy being places nearly as much as I enjoy the trip time under way." 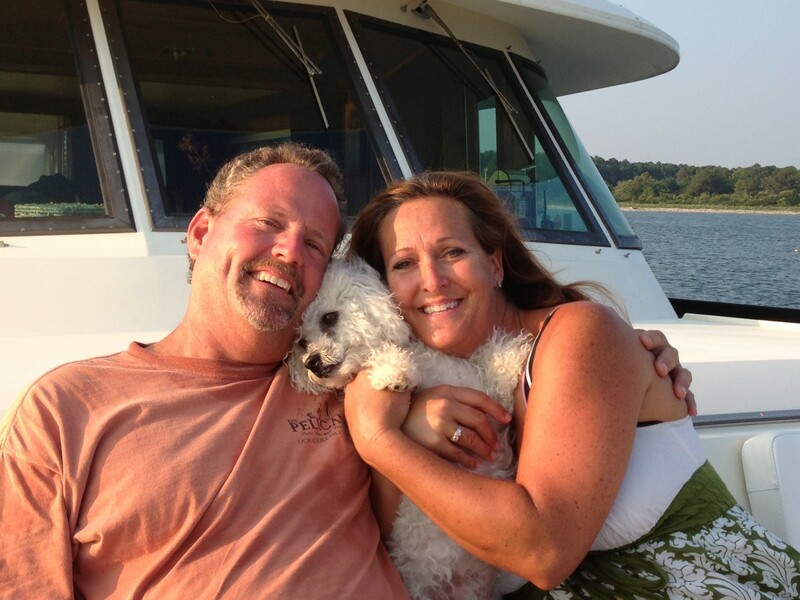 "My wife fell in love with this boat when we found it and has enjoyed making it our home with her personal touches. She named it as well, and we are totally enjoying the full-time cruising life together. ... She is the captain, does the navigation and driving. I take care of the engineering duties and maintain all the on-board systems." "Brand is one of the most important elements because buying what the market considers a good brand is usually step one on the path to getting a good trawler yacht - and buying a lesser or no-name trawler often leads to disappointment. Personally, I&apos;d go for a trawler from a builder that&apos;s been around and has been building trawler yachts for a long time - at least 10 years." "Personal comfort level is the range of differences between camping in a tent and staying in a Class A motor home. Ergonomics is also essential. The buyers must face the reality of their physical constraints as they age. Some boats are a gymnastic challenge to get on and off at different dock configurations or move around to handle lines. ... They need to be able to dock and undock solo, without dockside assistance. Aesthetics plays a part but should not dictate folks&apos; choice of a trawler. Pragmatism ultimately generates a much greater and enduring owner satisfaction." 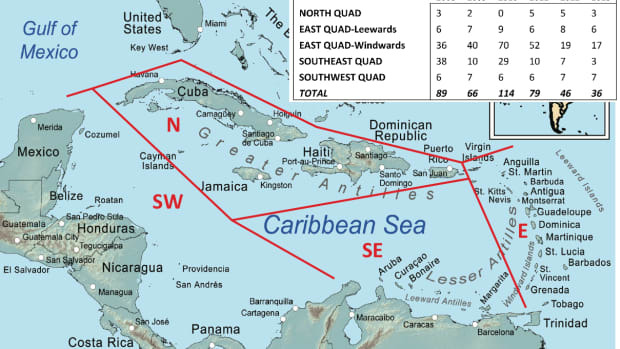 "In our seven years of cruising we have stayed at marinas less than 10 times. That is why a good/great ground tackle system is so important to us if you want to sleep at night. From a maintenance standpoint, simpler is better (and hence the Lehman 120s). In purchasing a trawler we&apos;d never buy new. 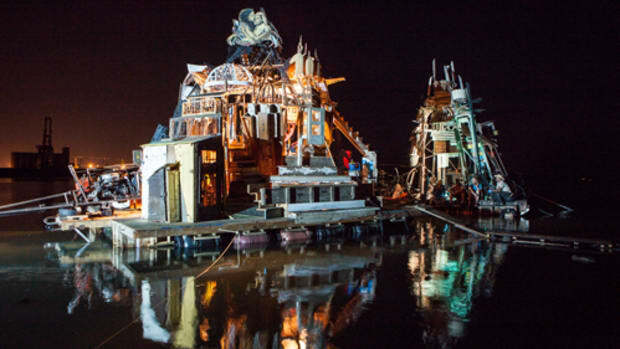 ... Get one that has been cruised and not spent its life as a piece of &apos;yard art&apos; at someone&apos;s dock." "We looked at a large number of trawlers, old and new, before we settled on our Ocean Alexander. Even went through a survey and subsequent rejection of an Independence Cherubini. We rejected most of the used/older boats because they were neglected beyond a point we were interested in rehabbing - mechanically, structurally and aesthetically. We drooled at many of the new boats but could not afford them. Looking at these new trawlers helped us develop our thinking about a used boat." 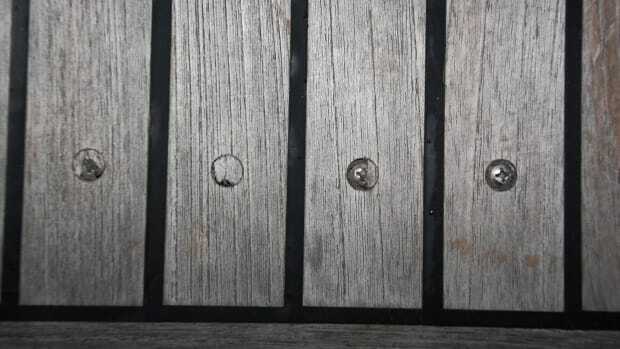 "Since we came from express cruiser-type boats, it was important that we got out of the hole and into a raised saloon. We needed fast with good efficiency (8 or 28 knots). Not being fully retired, we need shorter travel times. Also, good quality, current technology and value for future resale. We will move up in size and plan to live aboard in the future." "If money were no object ... oooh, temptation. No need for a megayacht for us, but we both agree a brand-new Grand Banks 41 Heritage EU would be perfect. It has the flybridge sedan style, with covered walkaround side decks, huge cockpit and upper deck, and a spacious, quality interior. This yacht has the classic style we love so much, but it&apos;s brand new. I&apos;m leery of pod drives and such, however. Too many things can go awry when the water gets thin. If money were no object, we might have to custom-order one without them." "My wife has overall say about the living areas, and I have overall say about the power and navigation systems. She&apos;s the chief upstairs, and I&apos;m the chief below. ... She wanted a pilothouse, while I was perfectly happy with a helm as part of the saloon. We got the pilothouse. Neither of us wanted a flying bridge - been there, done that. No flying bridge." "We are firm believers in simplicity - less to buy, less to maintain or fix, cheaper, less to go wrong, all of which means that you can get trawlering faster and cheaper. Just because a boat can have many batteries doesn&apos;t mean it has to. No reason that someone cannot trawler in the same manner as some sail - inexpensively."